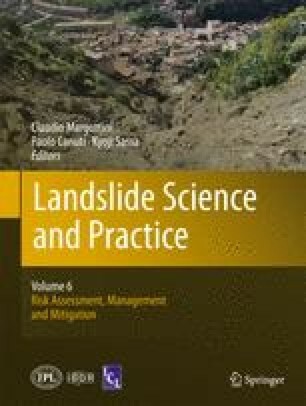 The Cassas landslide is located in NW Italian Alps and impinges on a corridor encompassing main transportation lines between Italy and France, hydro facilities and a village. The largest potential reactivation phenomenon is considered to be of approximately 10 Mm3, with a maximum depth of the main body of approximately 80 m and an average slope of 20–25°. The slide was the object of monitoring for more than a decade and special attention was devoted to it in view of the 2006 Torino Winter Olympics (the highway at its toe was the main Olympic lifeline). A formal quantitative risk assessment (QRA) and related monitoring program were performed. The integrated approach yielded interesting predictive/observational results, which drove stabilization actions including a drainage tunnel and the compilation of a highly sophisticated alert/crisis plan in case of future accelerations.